The Koenji Awa Odori is the Tokyo version of an enormous dance festival which originated in Tokushima City approximately 400 years ago. It takes place in various cities across Japan as part of the O-bon festival but the Koenji Awa Odori, as the name suggests, plays out in the beautiful Koenji District of Tokyo City. Each year during the last weekend of August over a million spectators gather here to watch thousands of participants dance through the streets. Here we will reveal when, where and how to attend this lively dance festival. 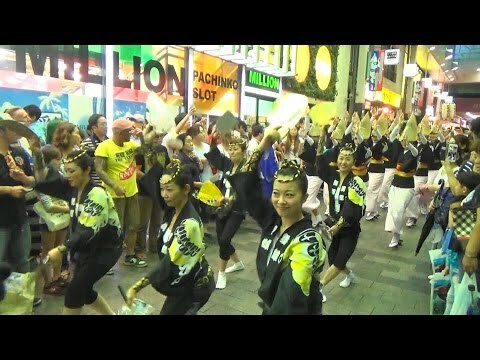 This video of the Awa-Odori Dance Festival is owned and created by Tokyo Omotenashi Channel. Each year around 10,000 to 12,000 dancers and over a million spectators gather in the narrow shop lined streets of Tokyo’s Koenji district. Dancers are divided up into groups known as Ren who consist of male, female and children’s groups. The dance is a competition and participating groups consist of various local community members, local schools and even teams from various other parts of Japan. Festivities kicks off at 17:00PM when most of the temperatures are cooler and consists of each team, or reno, to dance down the streets to the music of flutes and taiko drums. As with all Tokyo Summer Festivals there are lots of drinking and eating so feel free to indulge. The Koenji Awa Odori comes to an end at 20:00PM – 3 hours after it initially started so if you plan on attending but don’t want to be there for the entire 3 hour duration then be sure to catch the ending. In the end, all 10,000 to 12,000 dancers dance together as a grand finale, a sight well worth beholding. Those who wish to attend this lively and fun event will have to watch from the sidewalks. Luckily most of the streets are narrow so you will be able to see the action from up close. Keep in mind though that you will be competing with over a million other spectators for sidewalk space so things can really get crowded. Therefore, if you want to be up close you should get there before the dance festival starts which is at 17:00PM. Also, be sure to check the weather forecast in case you need an umbrella because the festival continues no matter even if it rains. The original Awa Odori traces its history back to 400 years ago in Tokushima City – which is still ongoing today. Koenji Awa Odori however, has only been celebrated for over 60 years as part of the much larger national O-bon festival. As a matter of fact, next years event (2019) will be its 62nd year. It started in 1957 as a means of stimulating economic growth in the then economic stagnant Koenji District of Tokyo. The plan clearly worked as today around 1,200,000 spectators gather in this tiny little district during the 2 days of the festival. The last Saturday and Sunday of August. The Koenji District, Tokyo City. Visit the official website of the Koenji Awa Odori festival here. The original festival dates back by 400 years and started in Tokushima City. The festival, known as the Awa Dance Festival still continues to this day and you can read more about it here.